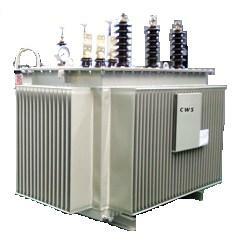 Single Phase and 3 Phase Oil Filled Distribution transformers are fail-safe with a long life expectancy. The fluid used are Shell Diala or BP JS-V/JS-A which are extremely stable and long lasting. During operation, the windings can be exposed to high electrical stress by external overloads and high mechanical stress by short-circuits. The transformers are designed with the best safety features in the industry, including accidental short circuits protection. The low-voltage windings are made of strip or flat wire, and the high-voltage windings are made from round wire or flat wire. These hermetically sealed oil filled distribution transformers are low cost but are very high quality and are manufactured using grain-oriented (G.O) steel. The top cover is bolted down to the main body with hermetical sealing. The High Voltage(HV)is Delta connection and the Low Voltage (LV) is Star or Y connection with the neutral wire. An earthling with a resistance of 21.1 ohms to limit earth fault current to 300 amps is available as an option. These transformers are for outdoor installations with brown bushing insulators mounted on top of the transformer for both the High Tension (HT) and Low Tension (LT) with an arching horn on the HT bushing. The operational temperature rating is -10 deg C to +40 deg C ambient. Humidity rating is 95% ambient. All manufacturing standards and testing standards are based IEC Specifications. Custom design are available. Please contact our sales@coilws.com for pricing and details. Coil Winding Specialist Inc custom designed oil filled grain oriented steel transformers are rated up to 10,000 KVA or 10 MVA. High Voltage of 22.9KVA, 6.6 KVA, 3.3KVA stepping down to any Low Voltage levels required by the end user. Higher efficiency and energy savings oil filled distribution transformers design and built with Amorphous Metal (AMDT) are also available. The pricing shown below are for reference only. Please contact us for quotes and delivery.